But following his success in Bournemouth, the 34-year-old from Longcross insisted it was the worst he had ever played in a tournament which he won. Harvey wrapped up a 2-1 victory over Pascal Richard (Gosport) with the day’s highest break of 95. 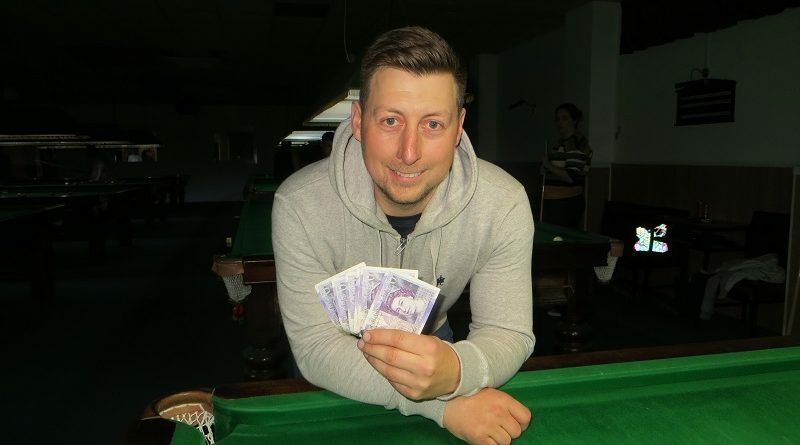 And he has been installed as favourite to clinch the £500 first prize in the Cuestars Championship for the top-32 ranked players at Waterlooville Sports Bar on Sunday, May 12. Harvey, who finished the season in third place despite competing in only half of the events, pocketed £120 for clinching the eighth and final leg at Greenbaize Snooker Club. He said: “It was probably the worst I’ve played for many years. “Until the semi-final, I didn’t make a 50 (break) in 13 frames. I managed to just do enough and crawl over the line. “It was probably the worst I’ve played and won – ever. Mark Lloyd (Gosport), who lost 2-0 to Harvey in the last-four, was crowned rankings champion when his Portsmouth league teammate Richard knocked out title contender Ryan Mears (Aldershot) 2-0 at the same stage. Harvey, who competes with Mears in the Byfleet & District Billiards & Snooker League, added: “I was going to try against whomever I was playing because I was more concerned about me winning than whatever anyone else was doing. “I beat Mark and did Ryan a favour but unfortunately he lost. The 24 runners for the event sponsored by Snooker Hub returned 22 breaks of 50 or more. An early contender for the highest of the day was a 71 by 13-year-old Oliver Sykes (Chandler’s Ford) in his first match against Martin Wallace (Wokingham). Anthony Rice (Fordingbridge) then made an 80 against Andrew Darken (Feltham) but was on the receiving end of an 81 by Mears in the last-eight before Harvey took the honours in the final. Richard, who had lost his opening frame of the day against Connor Benzey (Eastleigh), made it 15 winning frames on the bounce by taking the lead in the final. Ryan Mears: 81, 63, 52. Nick Jennings: 70, 58, 51. GROUP A: 1st, Mark Lloyd (Stoke SC, Gosport); 2nd, Nick Jennings (Churchills, Eastleigh); 3rd, Jamie Wilson (Waterlooville Sports Bar); 4th, Anthony Cutler (Greenbaize, Bournemouth); 5th, Mark Ridout (Greenbaize, Bournemouth); 6th, David Rice (Salisbury SC). GROUP B: 1st, Ryan Mears (Sovereign, Farnborough); 2nd, Elliott Weston (Top Spot, Havant); 3rd, Oliver Sykes (Chandlers Ford SC); 4th, Martin Wallace (Crucible, Newbury); 5th, Ryan Hughes (Chandlers Ford SC); 6th, James Cullen (Woking SC). GROUP C: 1st, Pascal Richard (Mayfair, Gosport); 2nd, Connor Benzey (Chandlers Ford SC); 3rd, Bradley Cowdroy (Greenbaize, Bournemouth); 4th, Kevin Impett (Salisbury SC); 5th, Darren Johnson (Petersfield Bowls & Snooker Club); 6th, George Heatley (Woking SC). GROUP D: 1st, Sean Harvey (Staines & District Conservative Club); 2nd, Anthony Rice (Salisbury SC); 3rd, Steven Hughes (Chandlers Ford SC); 4th, Dan Sykes (Chandlers Ford SC); 5th, Andrew Darken (Chertsey SSRN Club); 6th, Ray Mears (Sovereign, Farnborough). QUARTER-FINALS (12 points): Lloyd 2-0 Benzey, Harvey 2-0 Weston, Ryan Mears 2-0 A Rice, Richard 2-0 Jennings. SEMI-FINALS (£30, 15 points): Harvey 2-0 Lloyd, Richard 2-0 Ryan Mears. FINAL (£120/£60, 25/18 points): Harvey 2-1 Richard.